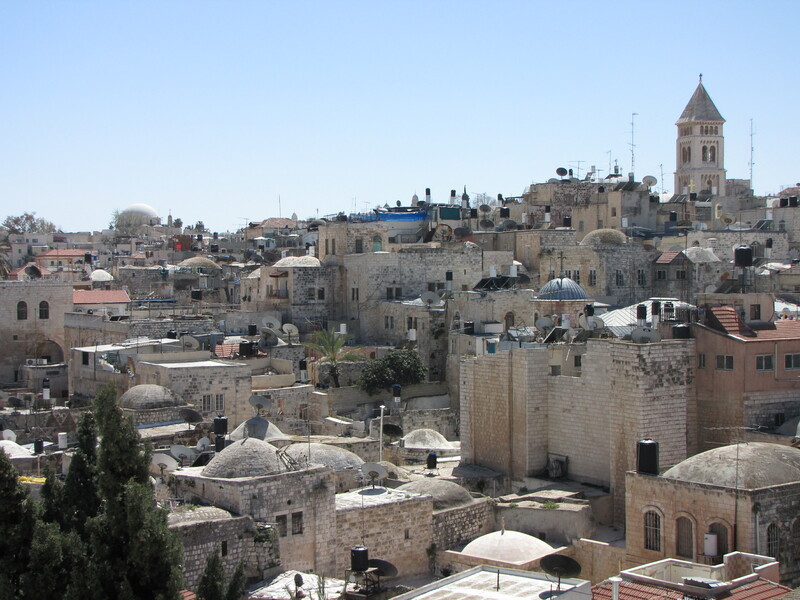 On our final day in Jerusalem we explored the Christian roots and historical sites that are located around Jerusalem. 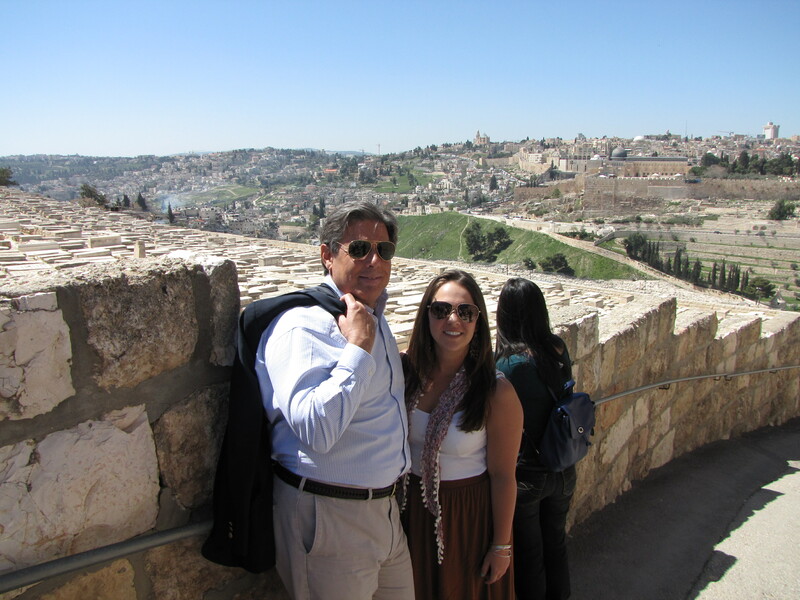 We began by visiting the summit of the Mount of Olives. 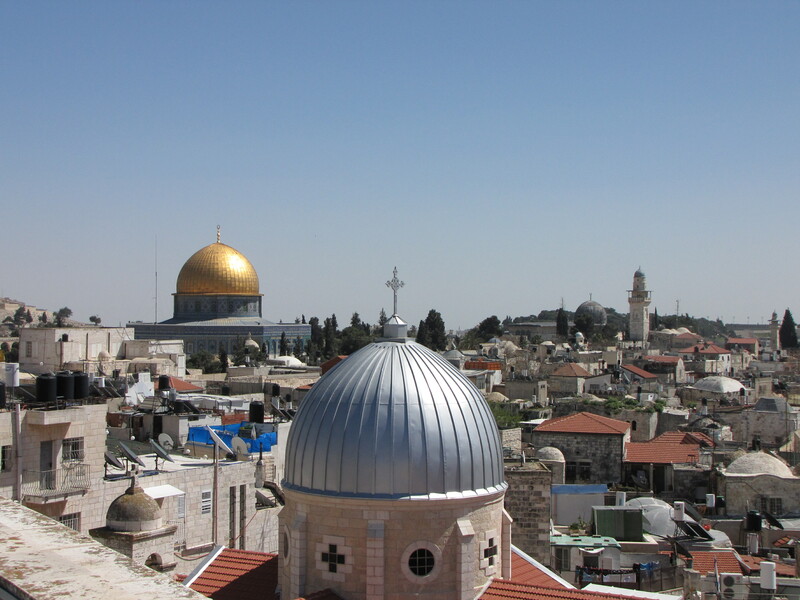 The Mount of Olives is especially important for Islam, Christianity and Judaism. 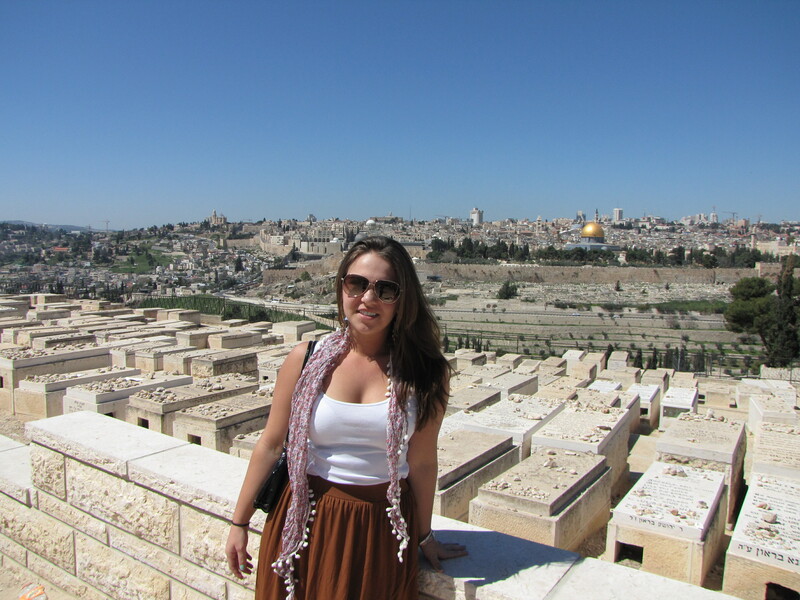 The Mount has been used as a Jewish cemetery for over 3,00 years and holds approximately 150,000 graves. 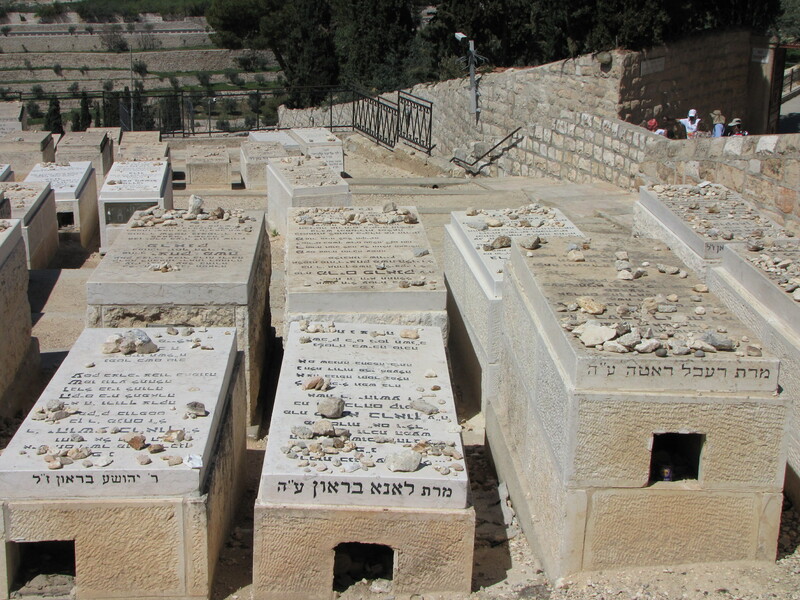 As you can see, rocks are placed on the graves rather than flowers. 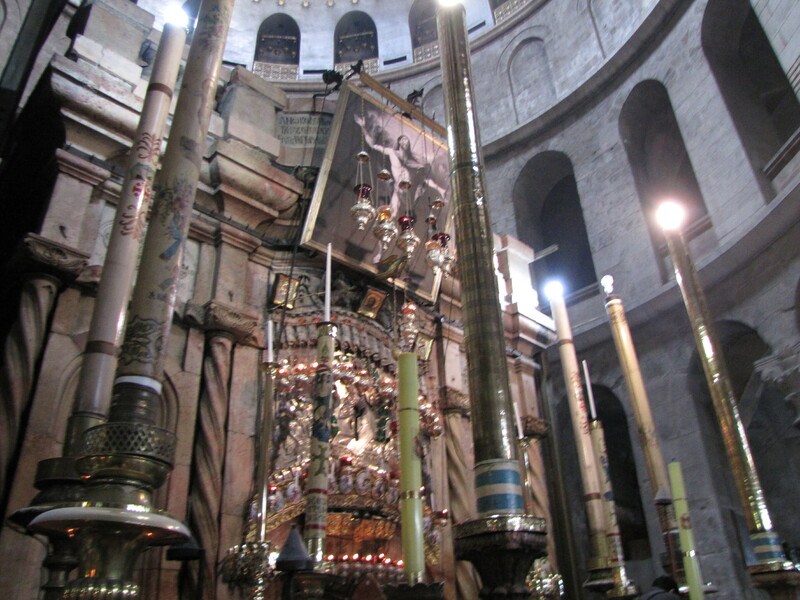 This is because the rocks will not be moved and do no wilt over time; therefore, they will be an infinite reminder of who has visited and how loved each of the buried were. 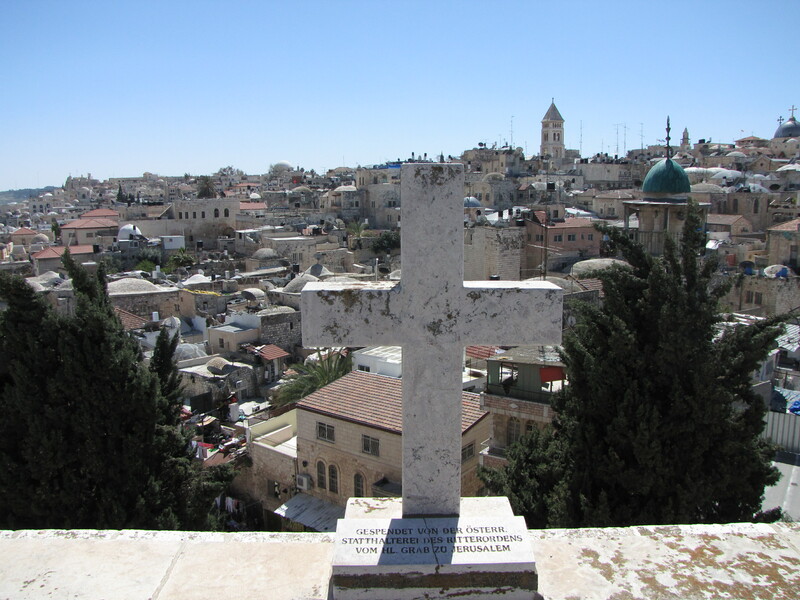 The Mount of Olives is important for Christianity because it is the site where Jesus ascends to heaven and now serves as a major pilgrimage site for Christians. 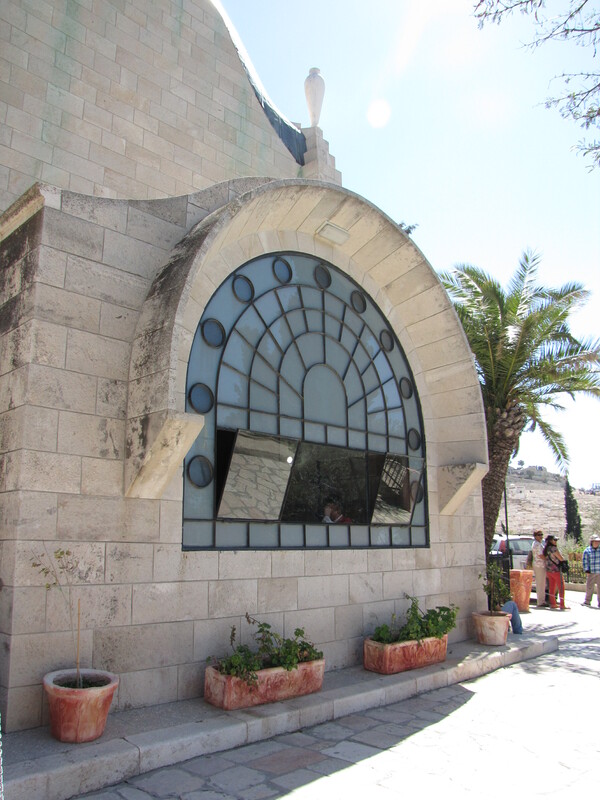 On the Mount we also visited the Chapel of Dominus Flevit, which was constructed by Italian architect Antonio Barluzzi between 1953-1955. 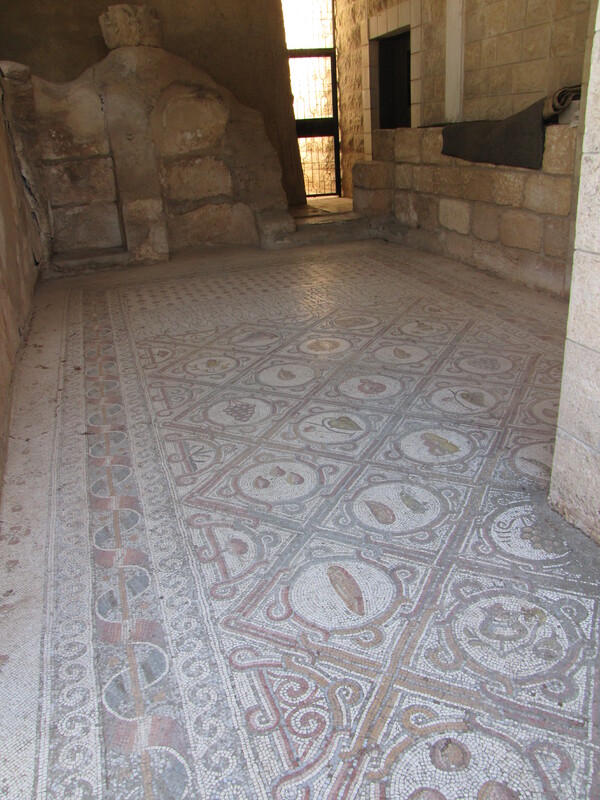 During the construction, archaeologists discovered artifacts that date back to the Canaanite period. 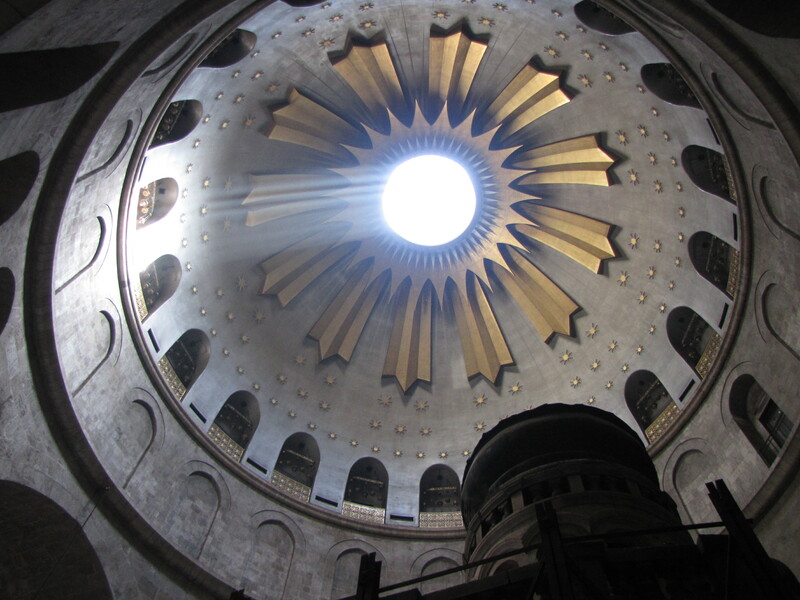 Dominus Flevit translates to “The Lord Wept,” thus the church was constructed in a teardrop to represent the tears of Christ, referencing when Jesus weeps because he knows that destruction is upon Jerusalem. 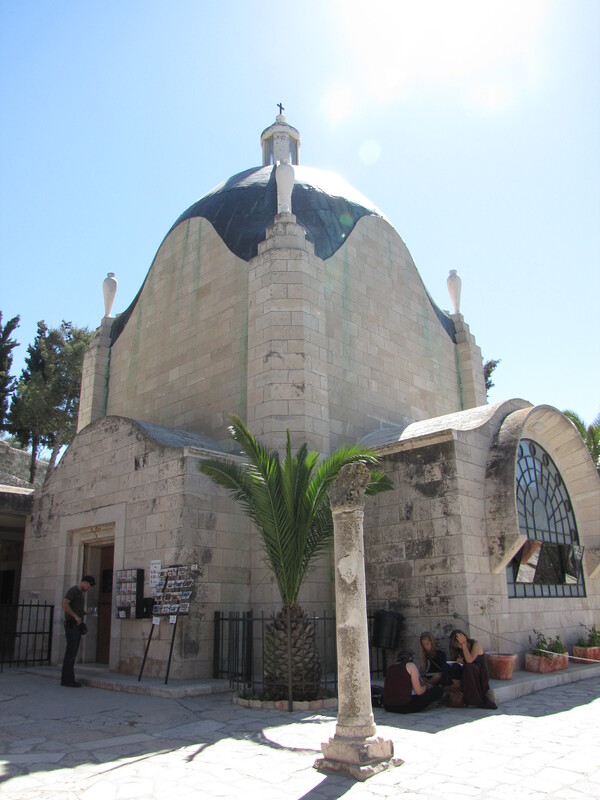 From the Chapel of Dominus Flevit we walked down to the base of the Mount of Olives to the Garden of Gethsemane. 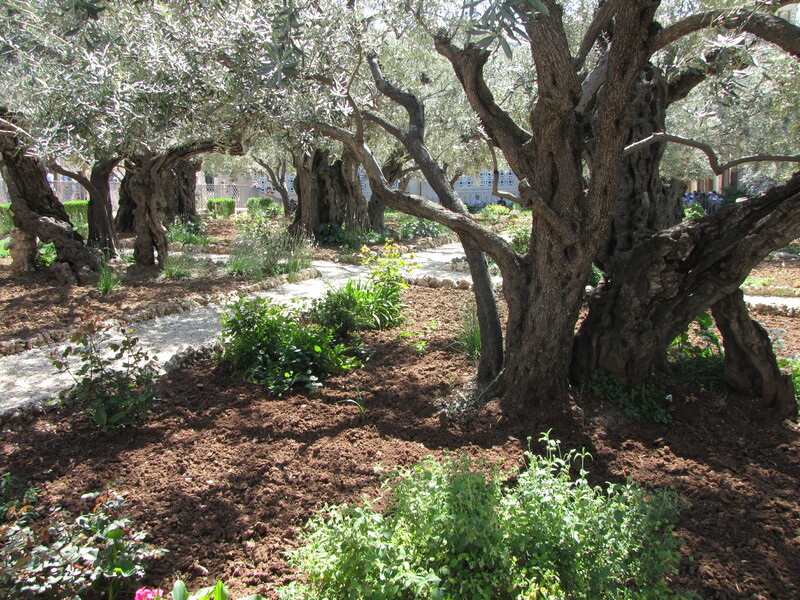 The Garden of Gethsemane is the garden where Jesus and the disciples visit after the Last Super. 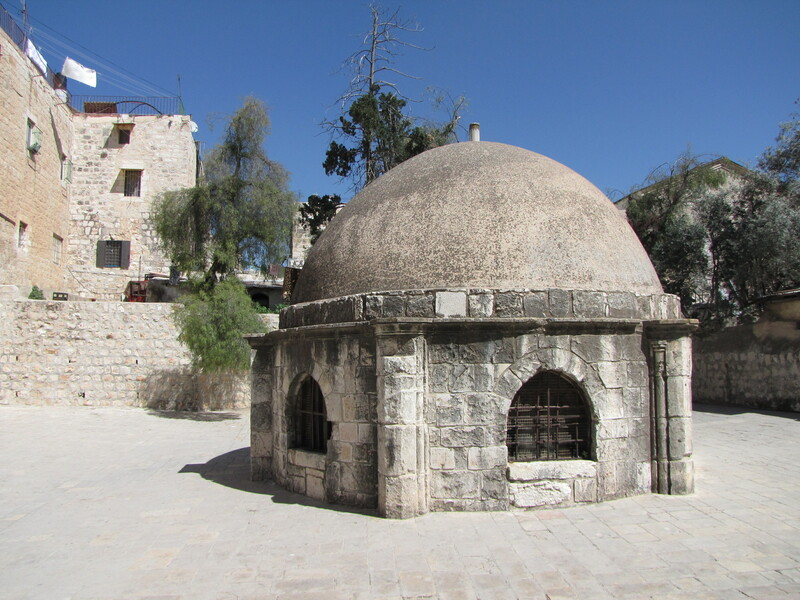 The disciples wait and accidentally fall asleep in the garden while Jesus prays to the “Rock of Agony.” Around the rock the Church of All Nations was built and we soon entered to see and say a prayer to the rock. 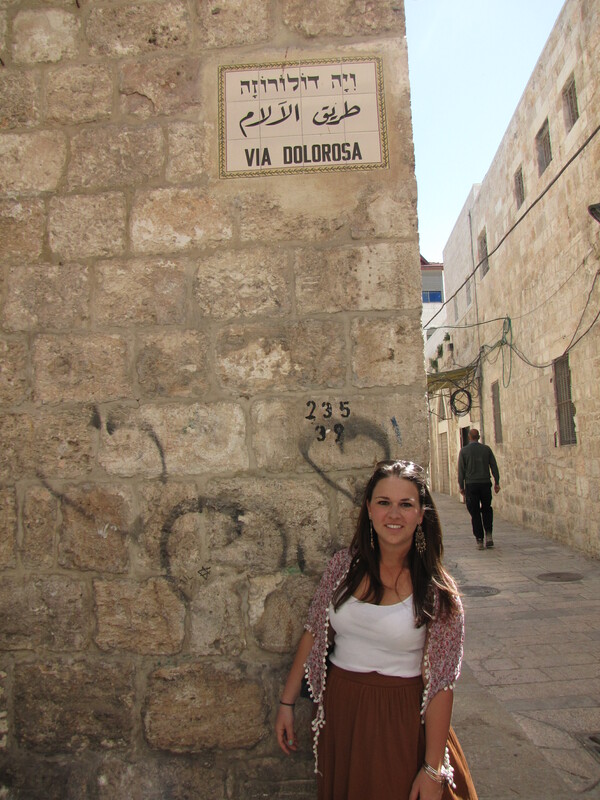 After bending down, touching my head and hands to the rock as I prayed we made our way outside and followed the ancient walk to the Via Dolorosa. 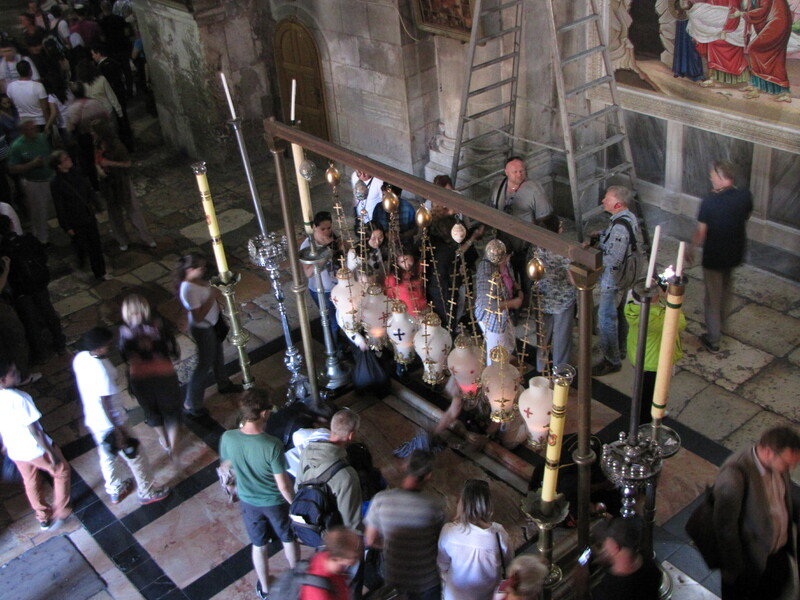 On the way we passed the burial site of the Virgin Mary. 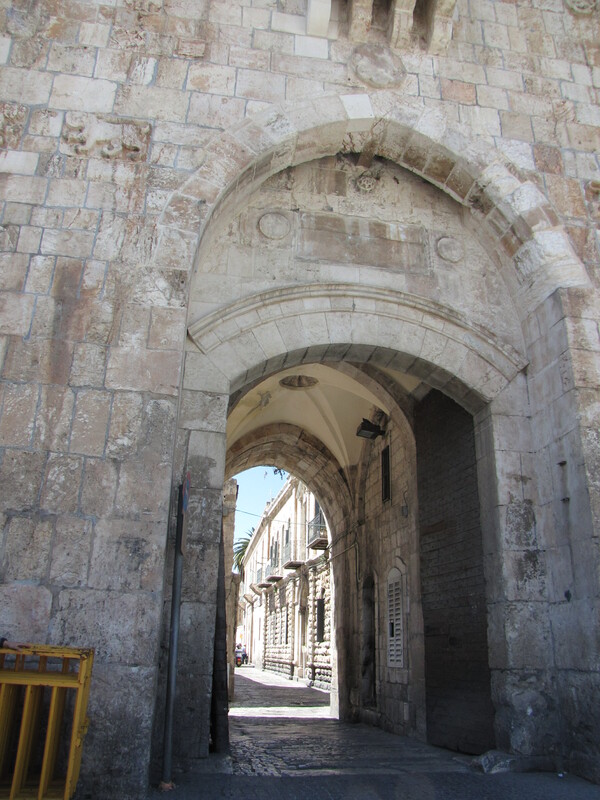 As we approached the Lion’s Gate entrance of the Via Dolorosa there was a spiritual pull calling me inside. 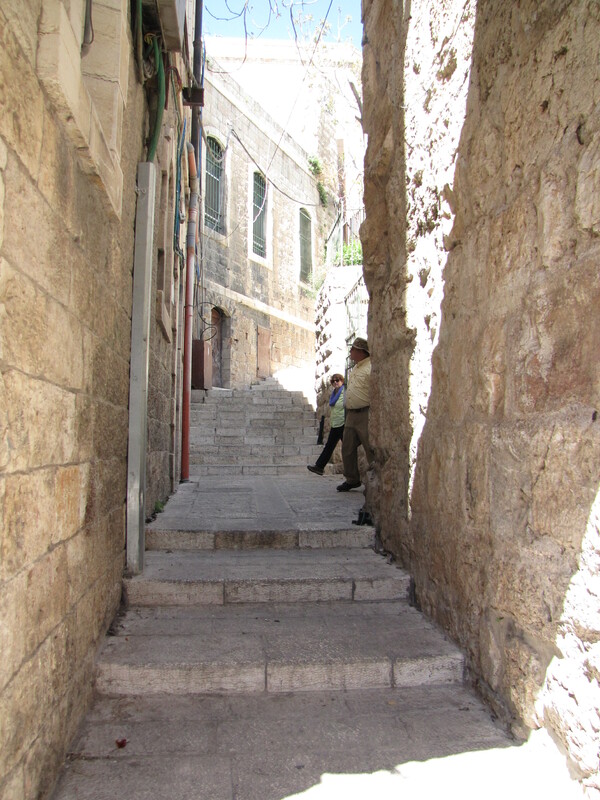 The limestone streets and buildings were so old yet showed no signs of aging. 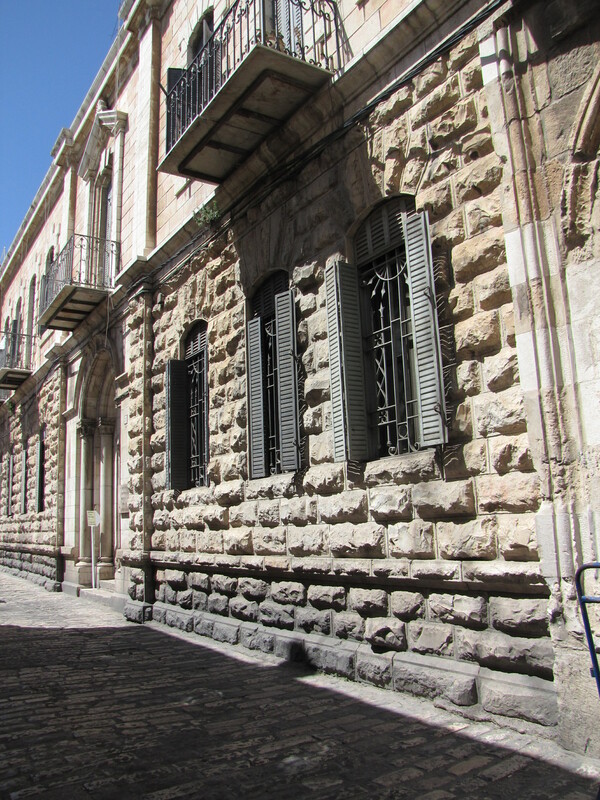 As we walked through the street I felt like I was living in a different time. 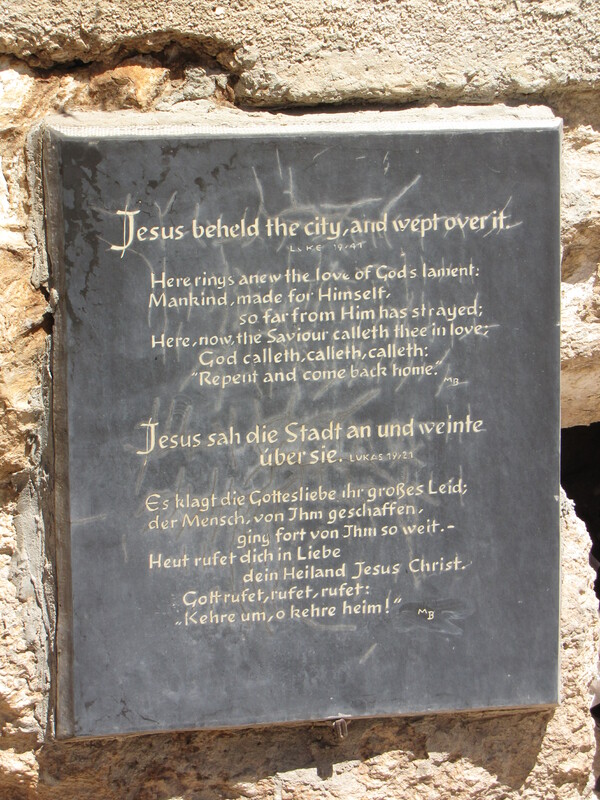 As if I had traveled back two thousand years in history, until a black BMW swiftly turned the corner and his honks for me to move aside brought me back to present day. 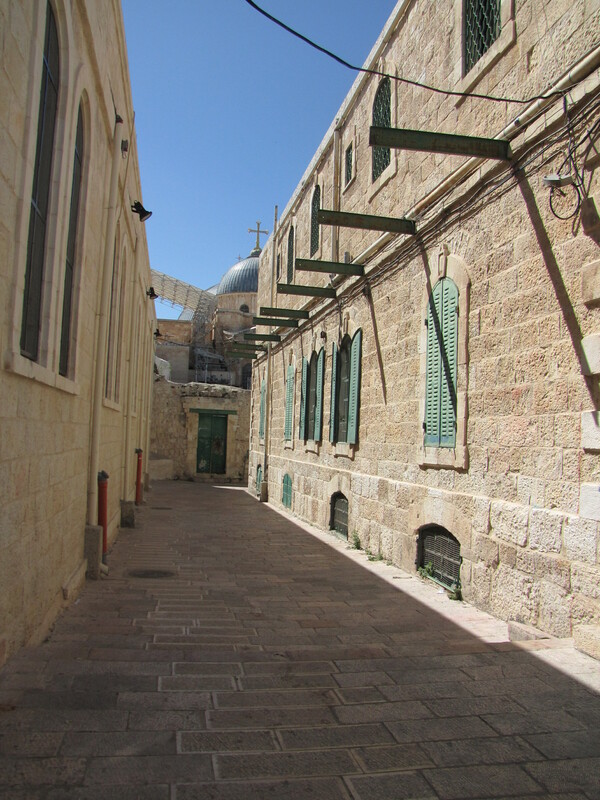 The street was lined with buildings I wanted to enter and explore and religious sites that I wish I had known more about. 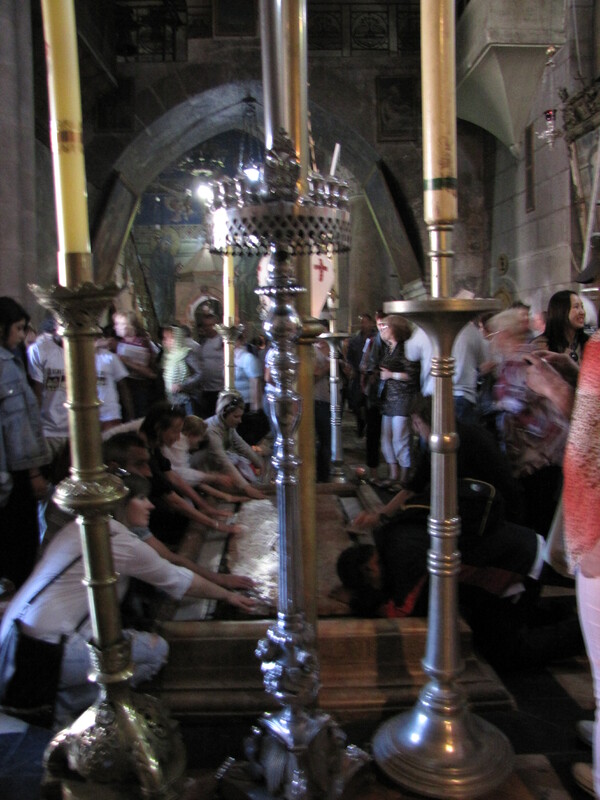 We first passed the birth place of the Virgin Mary and then shortly after we reached Bethesda, the site where Jesus cured the paralyzed man giving him the ability to walk. 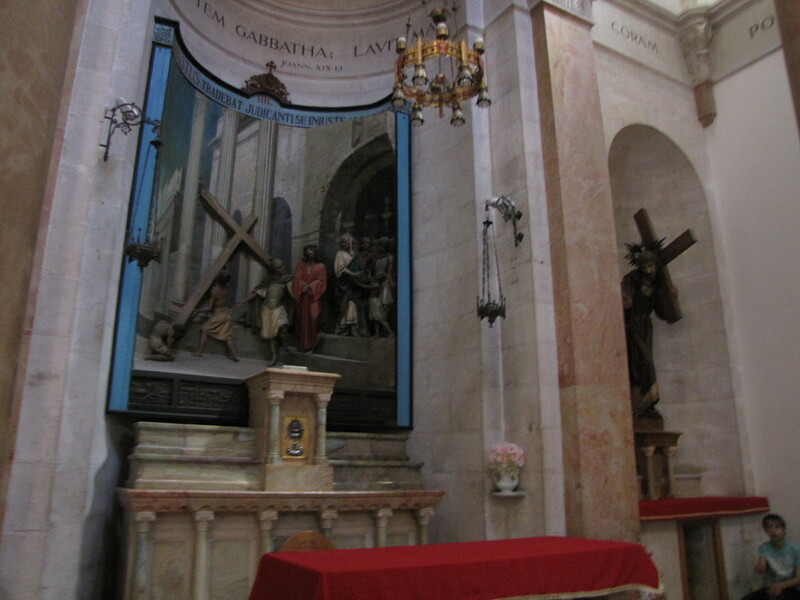 We then came upon the location where Pontius Pilate castes his judgement on Jesus and sentences him to death by crucifixion. 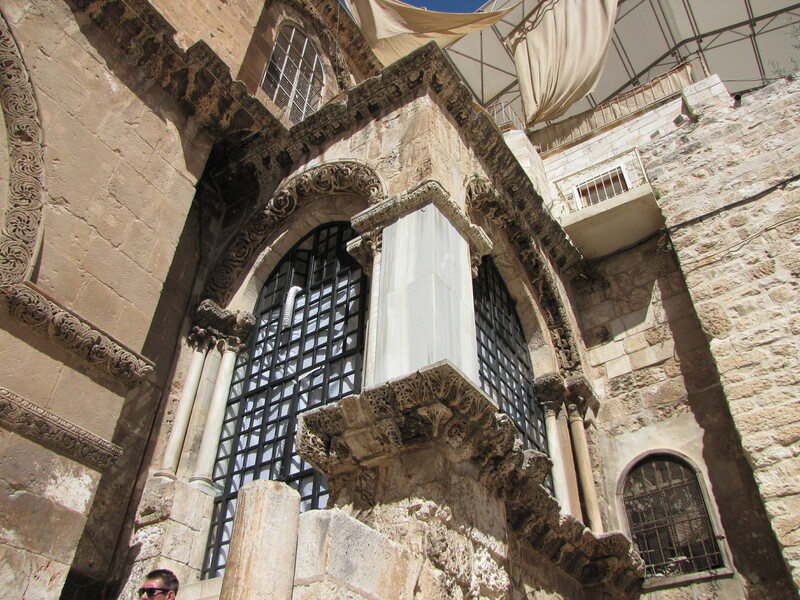 To mark the location where Pontius Pilate puts the thron crown on Jesus’ head, the Church of the Flagellation has been constructed and right next to it stands the Church of the Condemnation and Imposition of the Cross which is where Jesus is given the crucifix to carry along the Via Dolorosa. 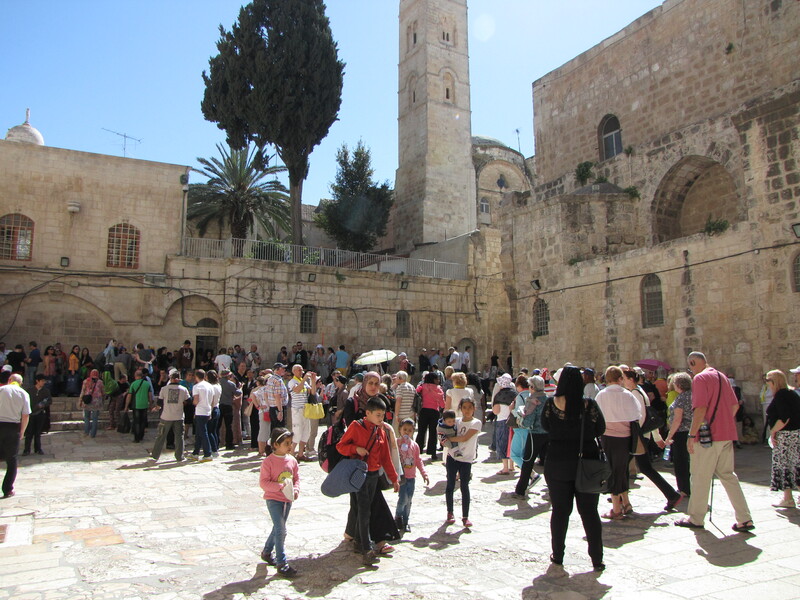 When we left the churches we quickly turned left off of the Via Dolorosa down a side street which led to the gates of the Dome of the Rock mosque. 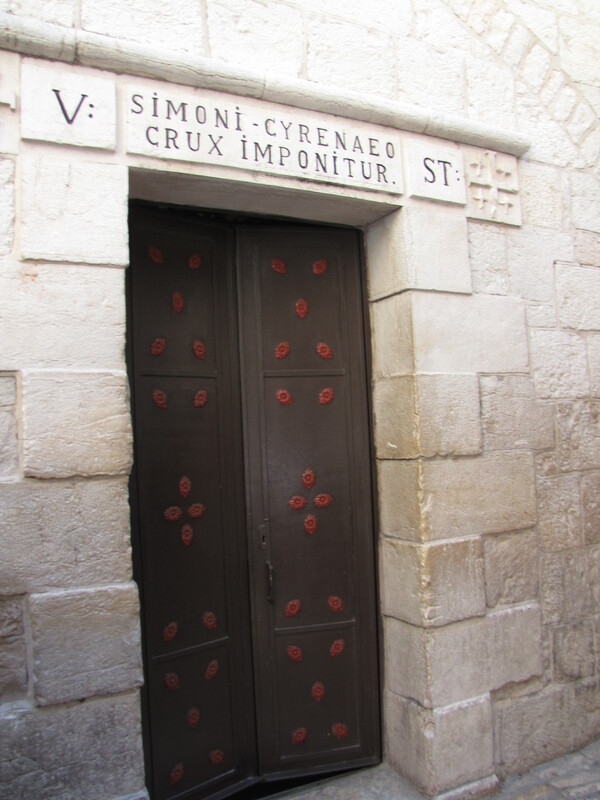 At the end of the alley there were large wooden doors secured with steal binding and protected by half a dozen security guards. 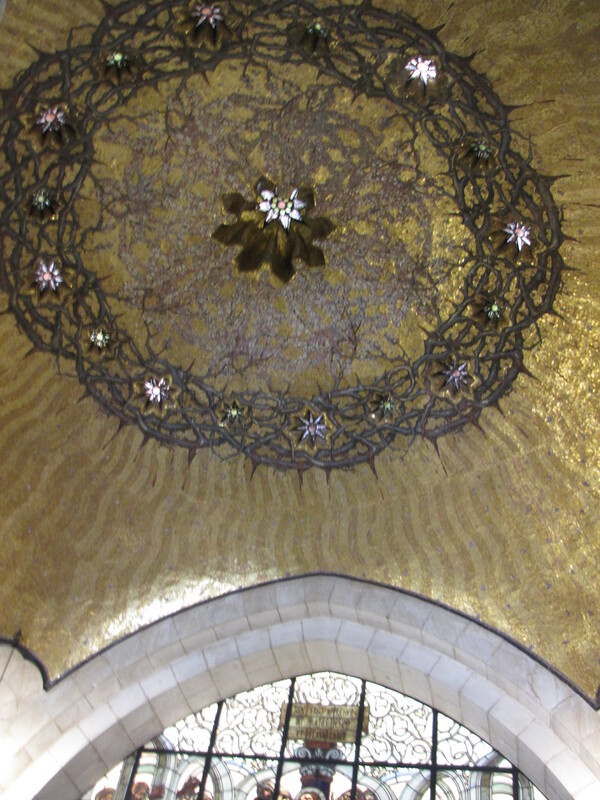 We sadly were unable to go any further because the Dome of the Rock Mosque is only open to Muslims; however, Steve promised we would shortly see a great view of the dome of the mosque. 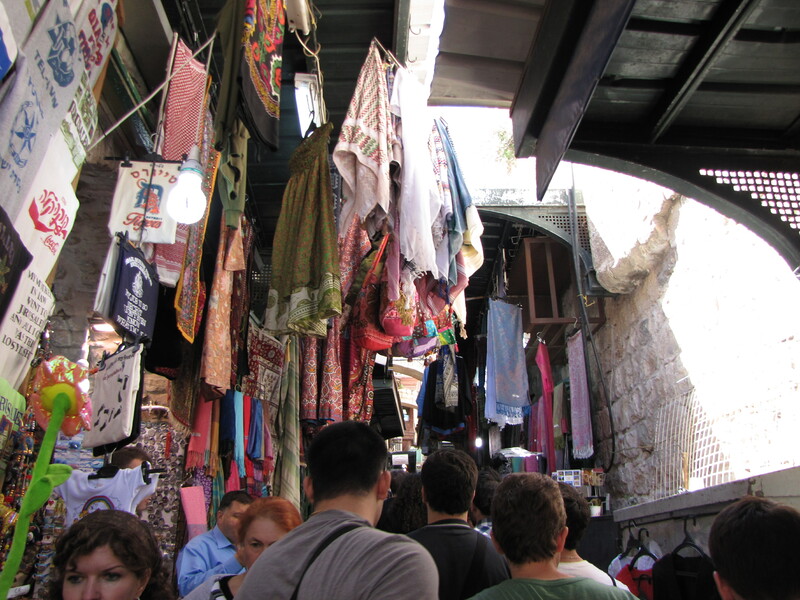 As we walked down the Via Dolorosa the vibe changed, we began passing vendors and store fronts selling scarves, rugs, and sadly, other tourist nicknacks. 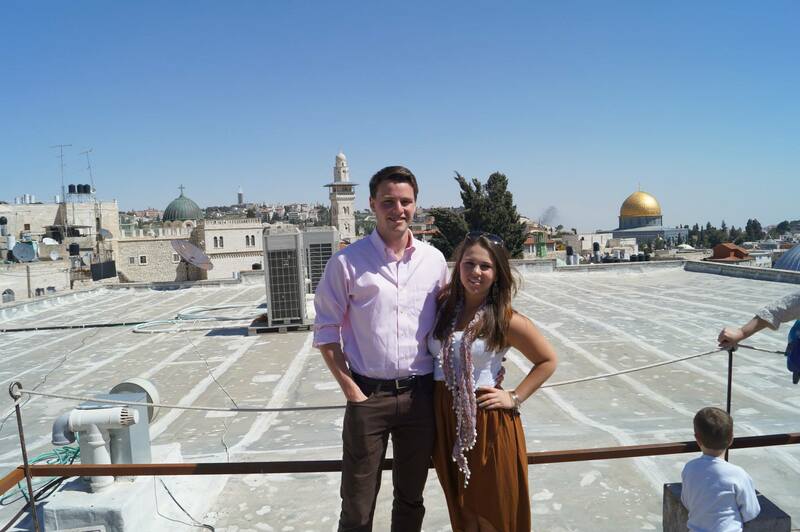 We then entered a building and walked up seven flights of stairs to reach the rooftop look out. 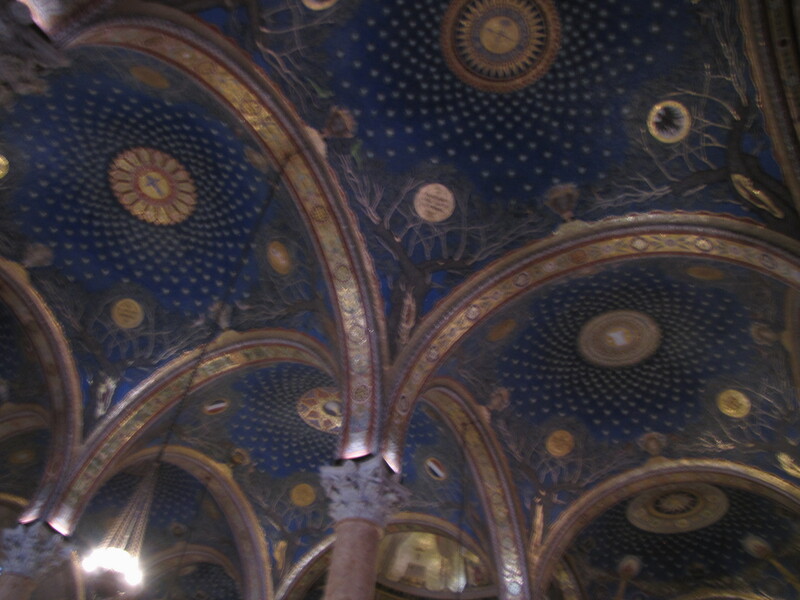 It was spectacular. 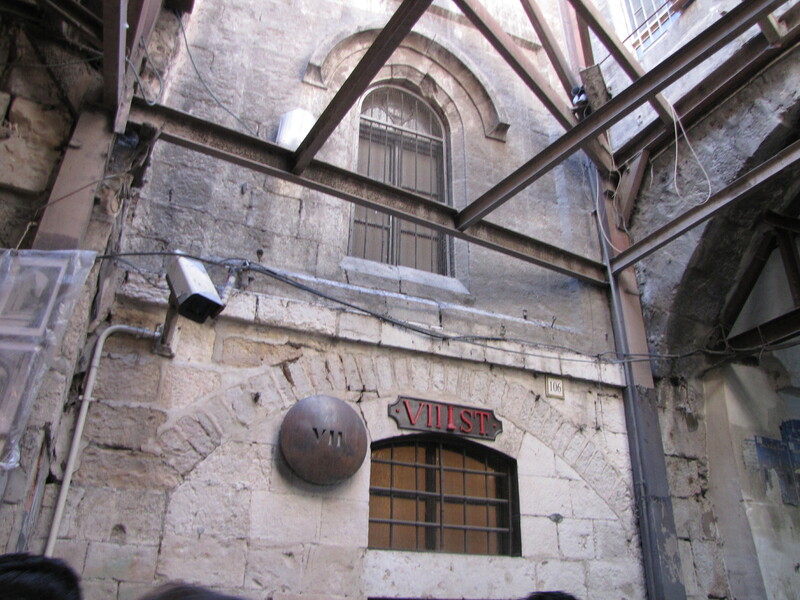 When we resurfaced on the Via Dolorosa we had reached the fifth station of the cross and would continue to see more as we walked. 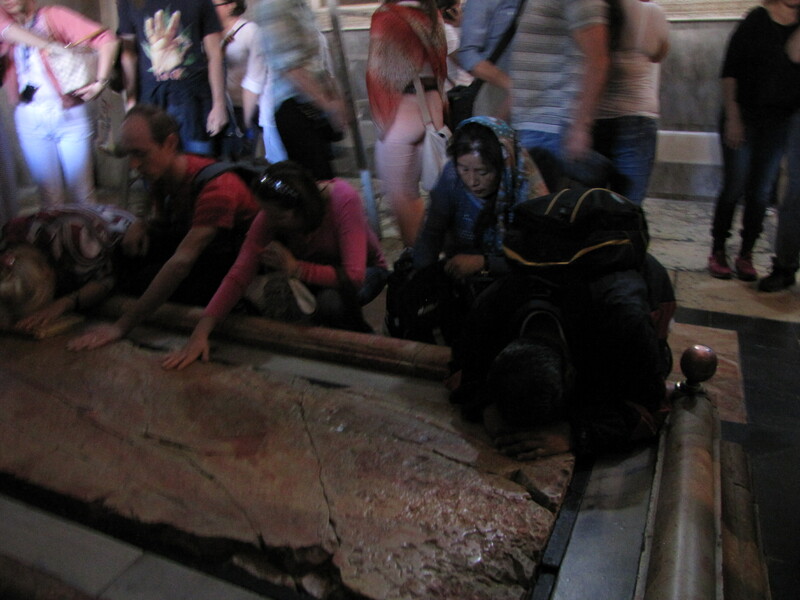 We had finally reached the Church of the Holy Sepulchre, the location where Jesus was crucified and buried. 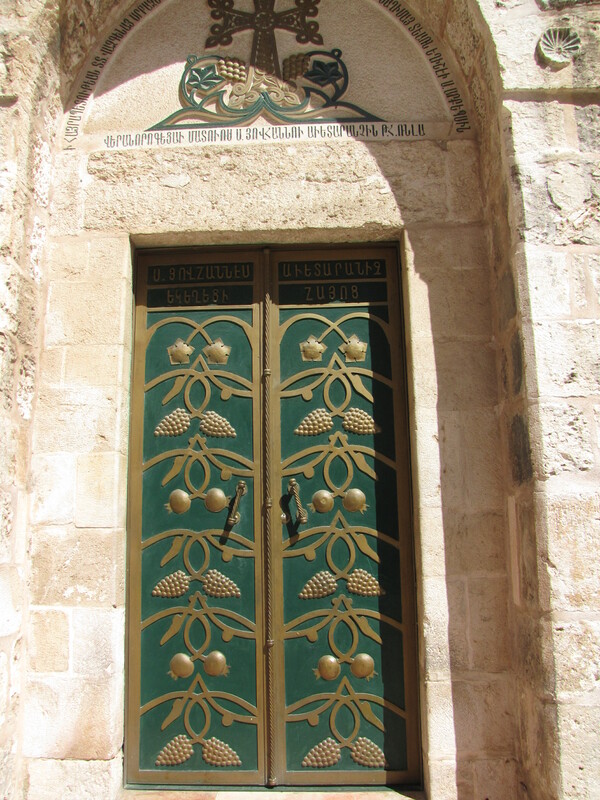 The church is shared between several Christian churches and as result has caused a lot of controversy among the different Christian denominations. 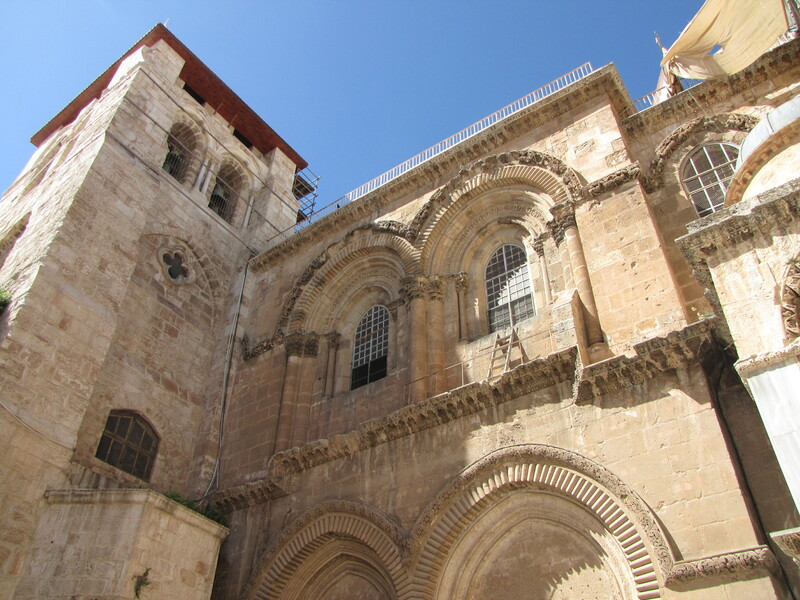 Outside of the church there is a ladder that has been in place for over a thousand years and no one is allowed to move it because they do not want one denomination to be able to move the ladder over another; thus the solution is to leave it there for eternity. 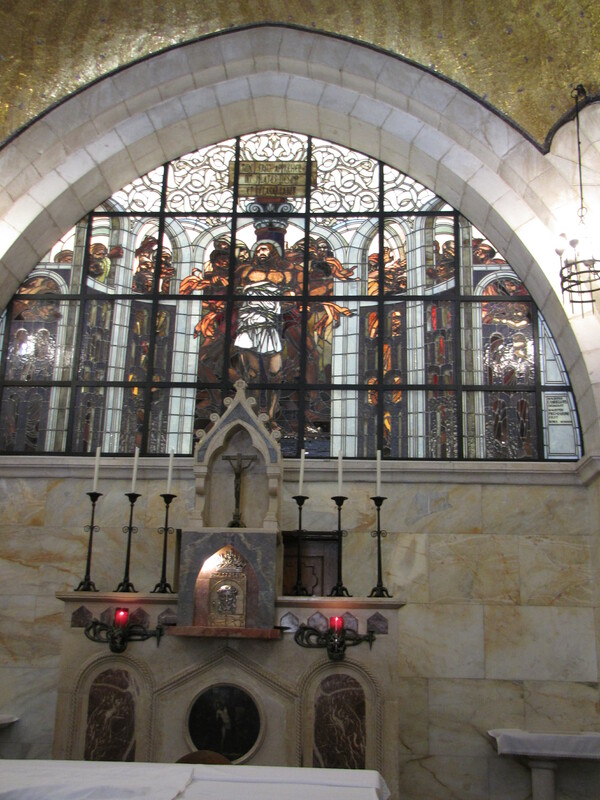 The interior of the church was very dark and was lit by red lights and candles. 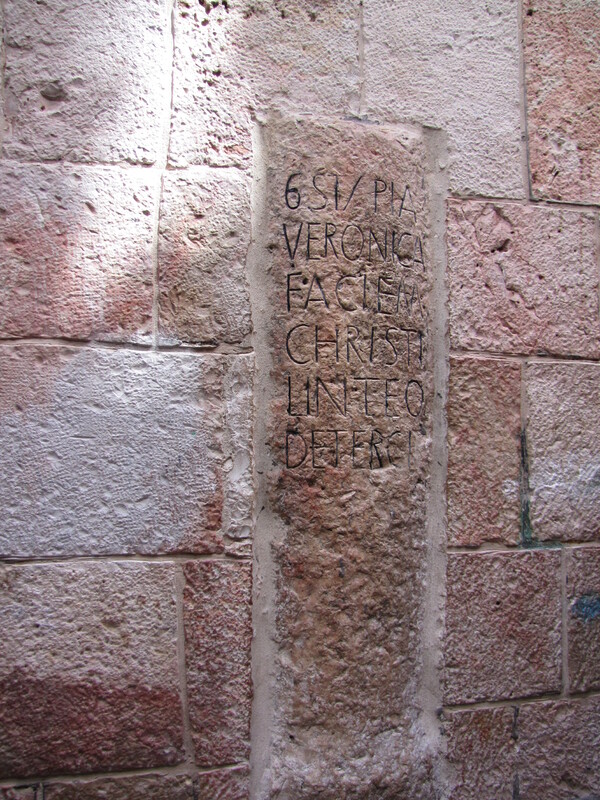 Just past the entrance was a stone which marked the crucifixion site and many people were bent over the stone rubbing their gifts and children’s clothes for the most sacred of blessings. 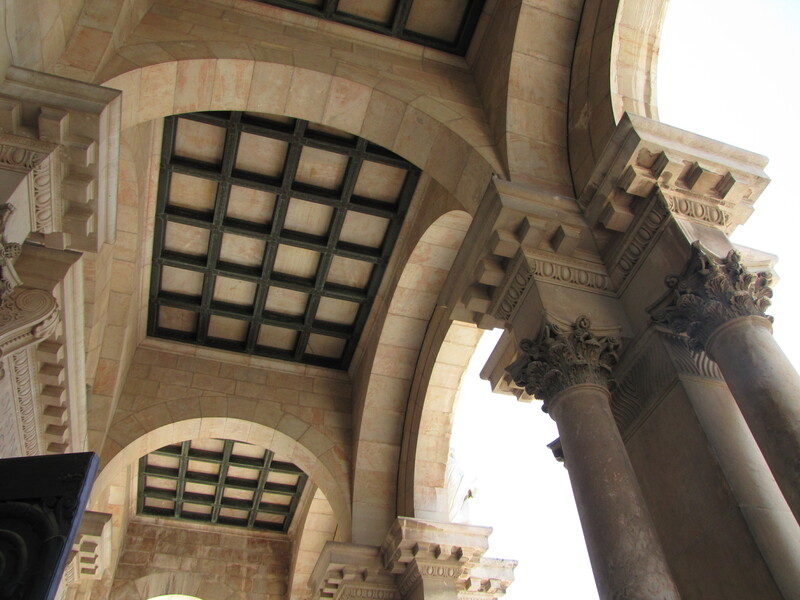 We walked through the different sections of the church that were specifically for the different denominations and admired the various architecture, decor and alters for each. 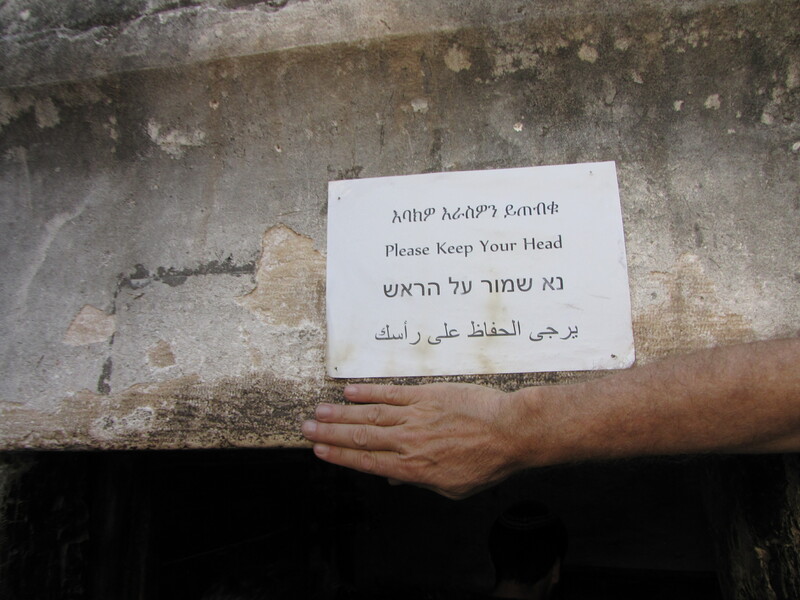 When we returned downstairs we finally reached the burial site which was enclosed by a protective room and was surrounded with crowds of people. 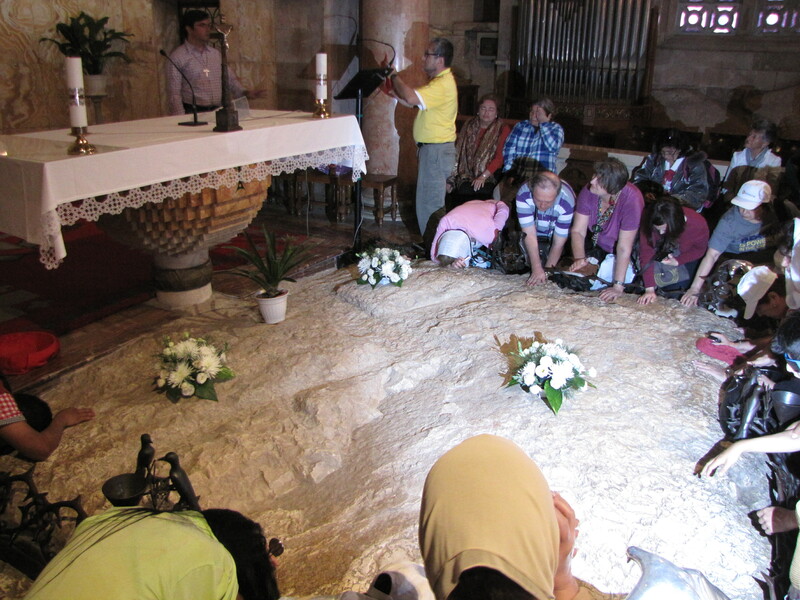 Our last stop in the church was underground to see the place where they believe the crucifix was found. 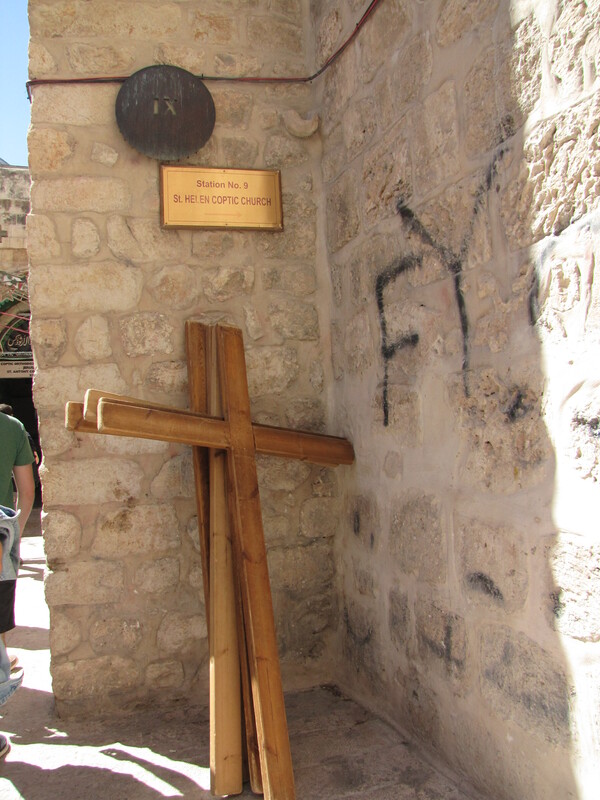 It is no longer there and there is speculation whether or not it is the actual crucifix but I found it to be pretty cool! 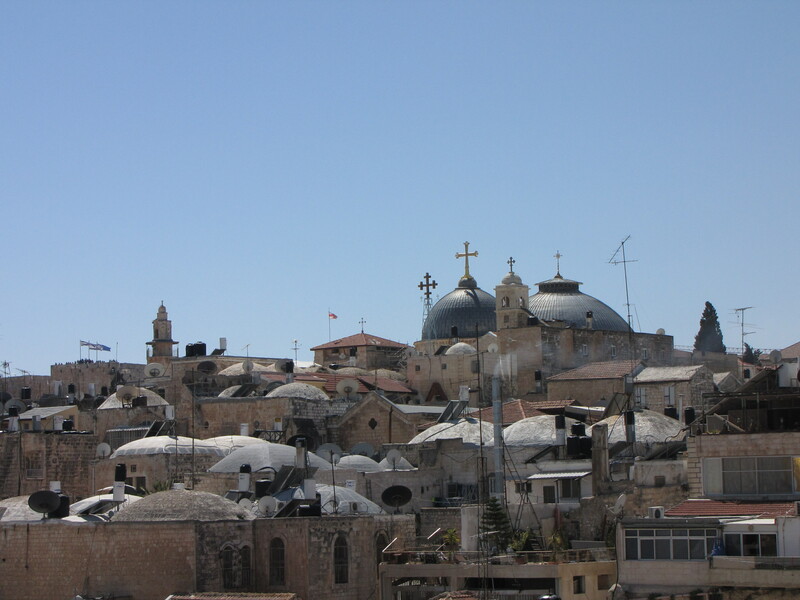 This had finally marked the end of our tour and we rushed out of the church in search of shawarmas (what had become my favorite food and pretty much only thing I ate all week). 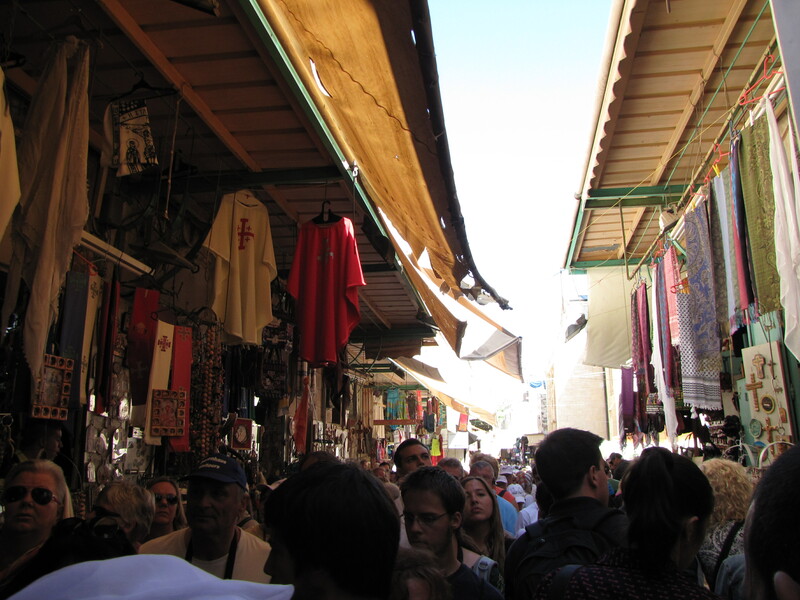 Kiana and I then spent some time shopping around the markets which filled narrow and ancient streets. 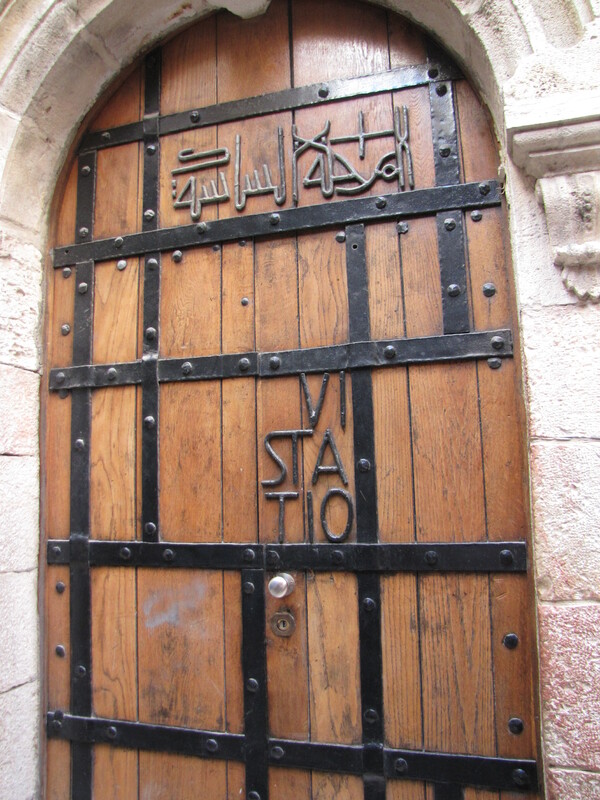 Our final evening was celebrated with a farewell dinner and a group all nighter because we would be leaving for the airport at 3:30am. 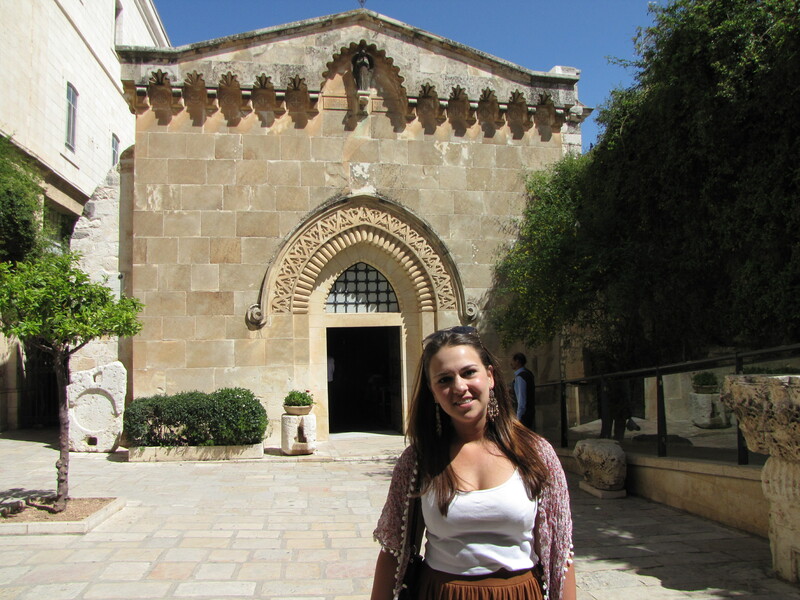 The trip was truly incredible and I learned an unbelievable amount in such a short time. 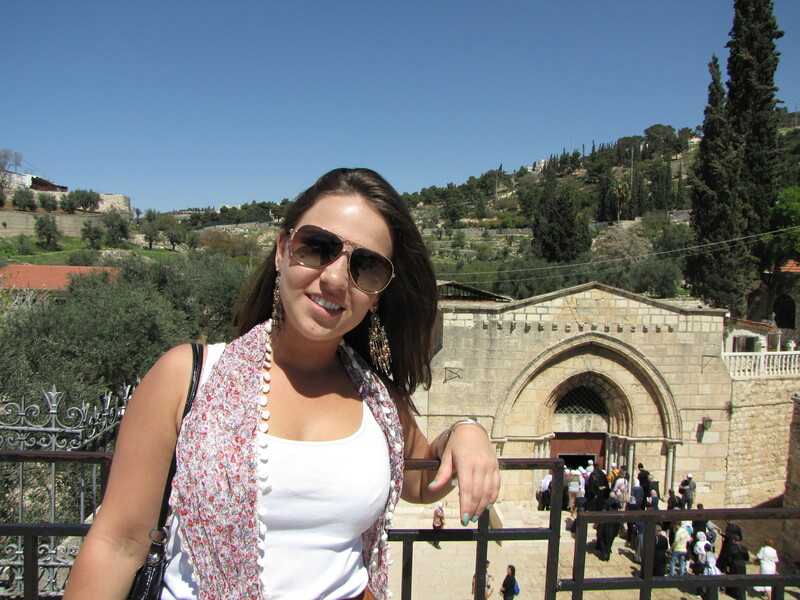 I gained exposure to the entrepreneurial ecosystem is Israel, developed a new perspective on the Israeli Defense Force, was shocked by the coexistence and history of a myriad of religions, and reinforced my love for trying and experimenting with new foods. I need to thank Professor Peter Cohan for all of his hard work planning this trip and his passion for teaching students, John Crisafulli for just being awesome and always making me laugh, my good friends who traveled with me and the friends I made along the way who made the trip as special as it was and finally and long overdue the Babson College Glavin Office of Multicultural and International Education. 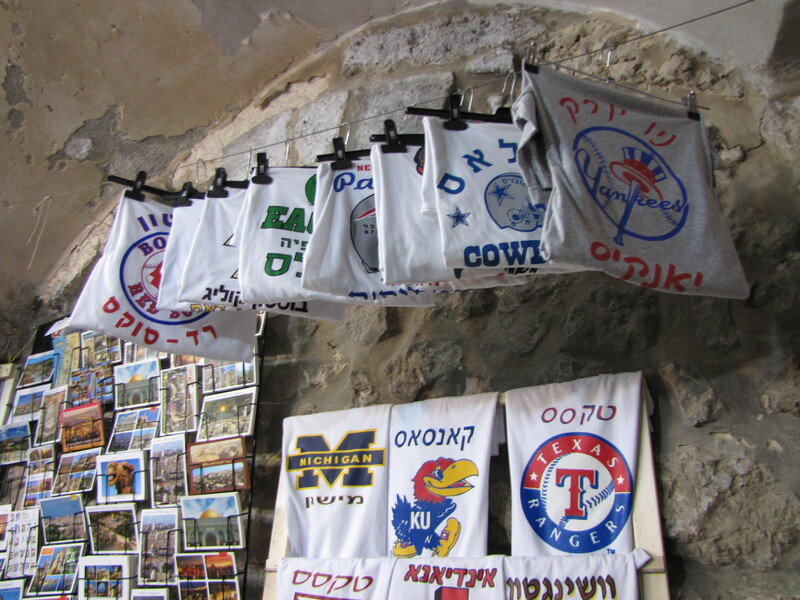 Through the Glavin Office I have been able to participate in three radically different study abroad programs in the span of a year and my life, perspective, outlook has entirely changed. 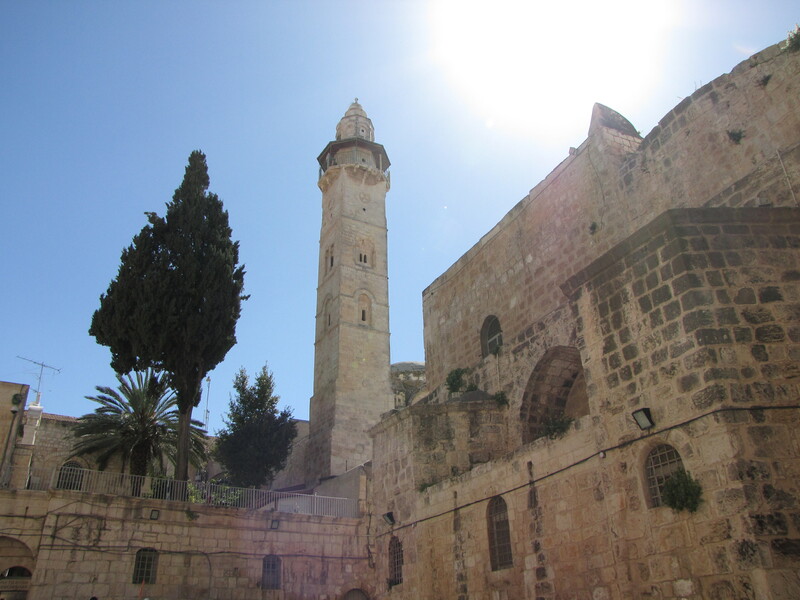 Although I have current plans to travel abroad in the near future, I know they will arise and I am looking forward to the next journey. 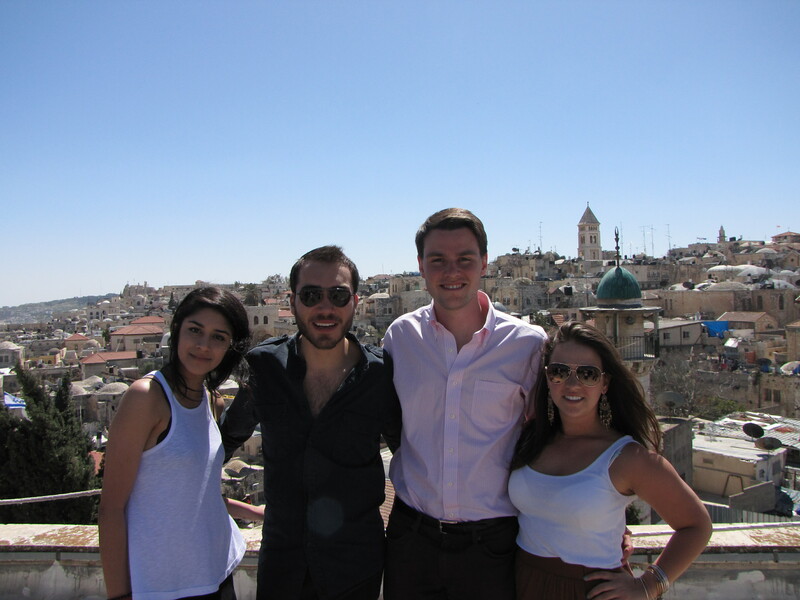 But for now, it is time to head back to Babson, finish off my senior year and graduate with the fabulous Class of 2014!